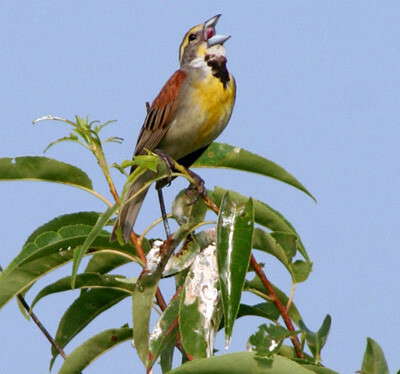 The dawn chorus is one of the most conspicuous vocal behaviors of birds, and one of the least understood. Near sunrise, birds often sing more loudly and vigorously than they do at other times of the day. Recent studies have suggested that these intense bouts of song may help male birds exchange information about their social standing. The most amazing dawn chorus I ever heard was in Sri Lanka. Wanting to take a bit of it home with me, I tried to record it on my little voice recorder, but my tape just couldn’t do it justice. When I listened later it was a scratchy thin rendition of what had been an entire symphony. Here in Ontario, my dawn chorus begins with the northern cardinal, just before sunrise. He’s followed by the American robin. Once those two get going, the rest join in — black-capped chickadees, various sparrows and finches, and I don’t even know what else. The chorus reaches such a pitch it’s hard to discern who’s who. Today I will leave you with a few dawn choruses from various locations around the world. Enjoy. PreviousDownsizing: What’s a naturalist to do? That is a time of day I usually miss, so this was a unique experience.